Well after a previous post indicating how to make the “CV Safety Rig” with lead core I thought I would show you how it was meant to look. As I have now found a reliable source for “the bit” ( the black piece of curved metal in the pic above) I though I would make one up to show you all how it should look. Come back later for an in depth look at how to make one of these rigs from the components. Note that this is the only time is it acceptable to super glue a bead to lead core, and if you make one from the picture above note that you only superglue the bottom bead. 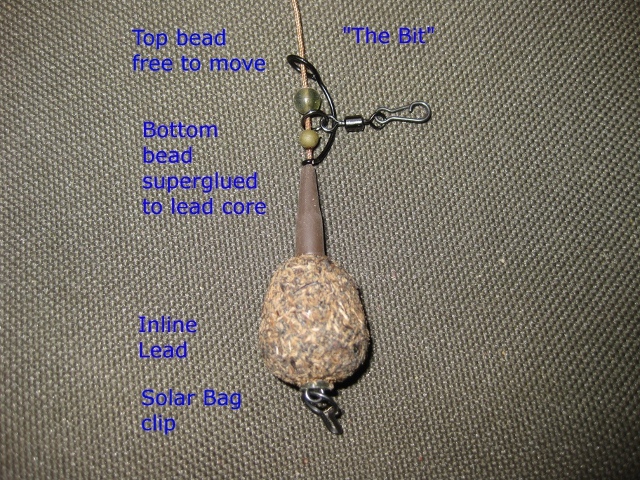 The top bead should be free to move and should slide freely over the join from leadcore to your mainline. Can I ask then how you stop “the bit” / the whole rig moving up the lead core ? is this purely on the friction of the lower bead on the leadcore alone ? certainly the way I have presented it is not dangerous at all as the top bead and “bit” are free to move and so it will release on a snagged fish. I glued the bottom bead as otherwise mine just moved around and I needed some way to stop it at a certain position whilst remaining completely fish safe. Let me know your thoughts.